Necessity can make people create the most amazing things. For example, some people will do almost anything to keep cool in the summer heat. Those of you living in the warmer regions of the world can relate to how frustrating it can be to spend time in a place without proper air conditioning. 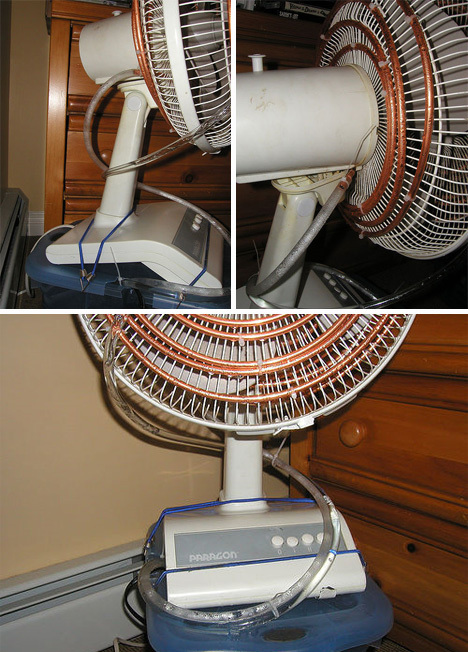 Well one creative Flickr user created a homemade air conditioner to cool his apartment. Here’s how he did it. 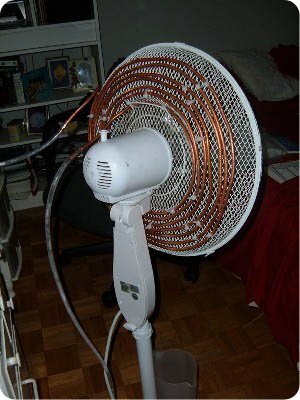 The DIY air conditioner was made using easily available household items that cost close to nothing. The air conditioner consists of an ordinary oscillating table-top fan, fish tank pumps, copper tubing and flexible plastic tubing. The photos show that the copper tubing has been formed into spirals and attached at the front and back of the fan. 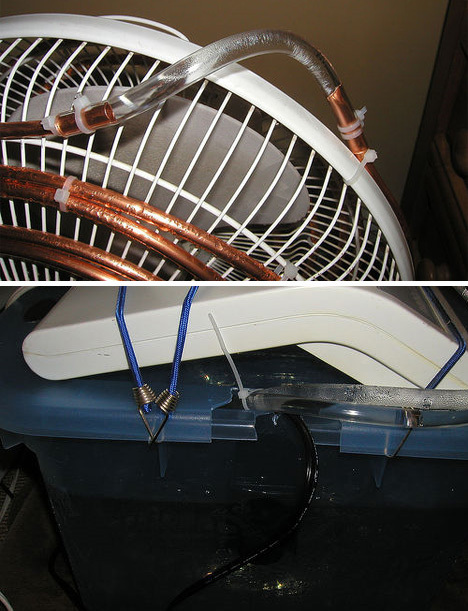 The fish tank pumps feed water to the copper tubing to ensure that the fan constantly blows cold air while the flexible plastic tubing connects the copper tubing to the cold water reservoir and allows the fan to swing in its regular fashion. The user has to add ice to the cold water reservoir every 6 hours to ensure that the water inside the reservoir stays cool. The exact cost is unknown but this is a pretty cheap solution. The only thing you have to be careful about when trying this at home is to make sure the reservoir is placed in a safe place, because electricity and water don’t make the greatest combination. breeze than the room temperature (around 4 degree centigrade lower than the room temp, measured with an IR thermometer).. I would suggest to get a plastic body fan if you want to try this, as a steel body can get ruined due to constant touch with water droplets.. I am from India and the ice melted really fast in bangalore climate (30 degree centigrade room temp now), so cant imagine about the rest of india where the temp can easily reach 45. All the best for anyone who wants to give a try.. you can reach me on vinayanpv@yahoo.com in case you need any help on your project.. thanks.. ??? ?????? ??????????? ?????? ?????????????? ??? ????????? ??????????? ??????????? ??? ??????? ????????????? ????????????? I am go make this project in my design engineering subject in college . so, I want to know about that with this arrangement how much temperature will down. Great for a dorm or somewhere that won’t allow AC. Alternative to the pump is to set up two containers and run the tubing as a siphon. If one lives in a more rural area, an underground copper tubing element might re-cool the water. It would still need to be pumped, but a basic solar setup should suffice. Home made air cooler system are download through internet But these air cooler systems are not sufficient to make cool our home. Try to understand my notion. Now new technology are available in the world. Hi, great ingenuity and thanks for posting, but wouldn’t it have similar effect to use the fan to blow air over a tray of ice? It would more efficiently transfer the heat from the air to the ice (no tube material to pass through). When air and water temperature stabilise, replace the ice. @74spider It would but then you will have add more ice more often then needed.. heat in the room would cause it to melt faster than if it was in a sealed container. If you need a machine that makes ice (which is the same as an a/c unit) to make this work, then you might as well just have an air conditioner. Cool project but very impractical. 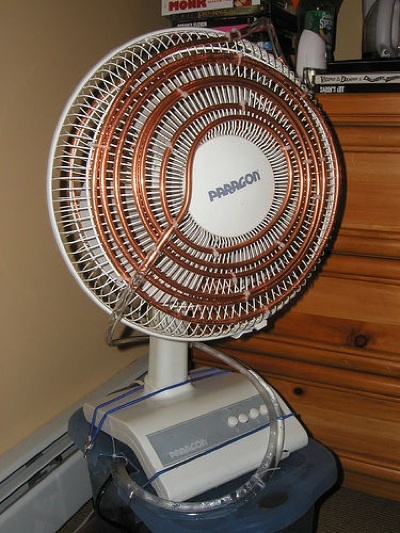 so best way is that…..take the metal box and then make 3 or 4 big holes for entering hot air and then fit fan outside the box, fit copper tubes inside it because in this way the condensation of copper tubes get down into the box and then from box to the tank and in this way its stay cool the room and never make humidity……. Yes correct we can’t overcome condensation over copper tube. instead we can use a plastic sweeper dust collector to collect the dripping water droplets accumulated over a plastic container. And the water condensation will stop once the ice coldness is reduced in water. 1. There’s no hazard of one’s getting electrocuted. The electric lines and the water lines are completely passing through separate routes, without interconnection or overlapping with each other. 2. Its not expensive either. The Copper tubing costed me something like $ 16, a small submersible pump (Chinese made, 25 W, AC) $ 3.5, Plastic tubing (2+2 meters) I already had in my store, some clips and clamps in another $ 1. So in total it costed me around $ 21. 3. Works good till the time the water is chilled ……. ice cold. The moment the water temperature gets high, the fan starts working like a simple fan. 4. The biggest drawback is to keep the circulating water ice cold !!!!! Once the water completes its one circle, its temperature rises like 4 to 5 degrees. So one could imagine how long one can keep the water chilled. You’ll have to keep doing the exercise of adding the ice in the box and removing the cold water out (remember cold not chilled). 5. Consequently, the results are NOT PROMISING !!!! sorry to say. Just remember, in the winter, you must frequently tend to a fireplace as well. If you don’t want to pay for electricity as much as possible, you have to do some things yourself. This, in fact, increases the temperature in your home. Air conditioners transfer heat from one location to another, typically through a vent to the outside. This setup does not transfer the heat from the fish tank or refrigerator to the outside. The fish tank pump and refrigerator are heating up the home more than this fan is cooling it down. i believe heat in room is used by the water to melt ice and rise its temp..so the room does not get more heated….. I prefer to purchase one if it is manufactured and marketed, instead of making one. still expensive and not safe!practicallity wise,buy a new air cooler!!! Another one improvement we can do that tank can be made up with insulating materials like thermocol or other , so that we can enhance cooiliing time . And another we can add coolent in to water for same purpose. Reminds me of me when I was a young boy. I still think the same way just a little matured. practically good! just an improvement: place your reservoir of cold water such that the water level is slightly higher than the highest point of the copper coil, to make sure that the cu coil is always full of water even if the fish tank pump is not in operation. connect the fish tank pump at the discharge end of the cu. coil which must also be slightly lower than the highest level of the cu. coil so that the fish tank pump is always primed. make sure that the discharge tube from the fish tank pump is slightly higher than the water level in the cold water reservoir, so that the water head is minimal so the work required will also be minimal. connect the supply line of the cu. coil an inch or two above the bottom of the reservoir and be sure that the volume of water in the reservoir is greater than the total volume of water inside the cu. coil. seal all supply and discharge points and connections then check for water leakage. Through all this effort, it would be so much simpler to just buy and air conditioning unit! I see condensation. condensation and electricity also don’t mix. this experiment is all well, until you a: get electrocuted. b: trip on the wires, face first to the fan. or c: the fan goes inside the bucket, because the top was poorly built. Fish tank pump pumps air, not water. he used a submersible circulating pump commonly used in water fountains and ponds. instead of water, replace with anti-freeze, or AC coolant for a car and see how cold that gets. Water disperses heat better than antifreeze. Adding an alcohol sub components such as “water wetter” may help.